The Regulator model skis we tested from Facet were pressed by Never Summer Industries in Colorado as an evaluation to see if Mike and Joe liked the production quality and pricing available by outsourcing their design to one of the most successful ski and snowboard OEM shops in the United States. 30 Pairs available - 15 in each size of 171cm and 181cm. This pair showed Never Summer's excellent fit and finish with a great textured topsheet with vibrant, clear graphics. The skis were moderately light and showed a soft flex and quiet, damp feel. Moderate rocker in both the tip and tail with some camber underfoot indicated this ski is an all-mountain twin with playful character and a short effective edge personality. These were a nicely built skis. Sidecut geometry was moderate, neither super carvy or straight. Impressive two year warranty. Eastern corduroy, packed powder and hardpack groomers & boilerplate. The Facet Regulator is a great example of what a modern "park & play" ski can be for people who crave a soft, compliant, sporty and loose-feeling ski to scoot all over the mountain for tricks, jumps, goofing off and playing around in all kinds of snow other than rock-hard boilerplate. The Regulators are light-feeling, quick and playful with a good amount of tip and tail rocker, so they ski much shorter than they measure, and pivot underfoot with zero effort or tip/tail hangup in bumps or cut up terrain. The soft flex means you can bang them through pretty much anything and they soak it up with ease and agility, but show a bit of insecurity on boilerplate and at high speeds. The Regulators require essentially zero effort to ski, but deliver a quick, quick, quick response and ability to change direction on a dime and never catch an edge. They trade a lack of high-pressure handling capabiity for surfy-quick antics and a spin-pop-jump personality. 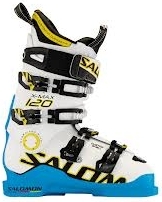 This ease of handling also makes them a great choice for older skiers who want an easy-to-turn ski but also want a nicely balanced platform beyond that offered by bargin-basement intermediate skis. The Regulators are a high-quality, well-designed ski to play all over the mountain in a loose fashion without demanding an athletic pilot at the wheel. These are not a carving type of all-mountain ski, but a park-like ski with all-mountain genes spliced into it. Tne soft and compliant nature of the Regulators make them a bit shy about biting into a rock-hard surface along the effective running length of its edges at higher speeds, but it can bite nicely underfoot when pressured quickly to change directions. You never get the washout feeling of an overly-rockered ski on the hardest surfaces, but you will get the feeling of skiing a very short ski with not much tip or tail extention beyond your bindings if you ride them too fast on boilerplate. Conversely, if you are whipping through some hardened, somewhat tight bumps, the Regulators soak up the hard hits in the their soft tips and tails, letting you bite the frontsides, backsides and tops of the bumps with you feet and they're pretty quick about it. This ski is not meant to be a race-like carver, and if you want a soft and surfy twintip ski, you'll probably understand you're not winning any beer league races with it on the hard stuff. Facet does make a ripping hardpack machine called the Porkchop. 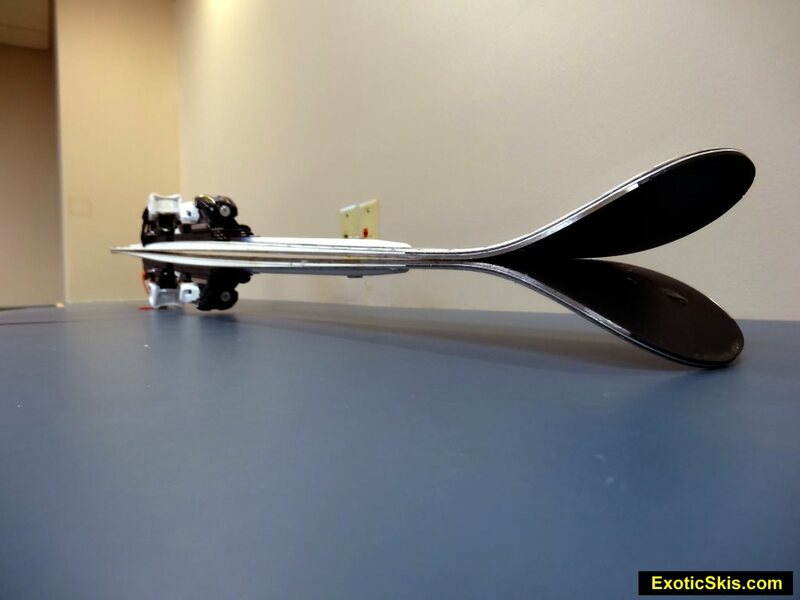 See our review of it under the Facet review category here at ExoticSkis.com. The Facet Regulators are really fun to whip around in mixed surface conditions, cut-up or tracked-out powder surfaces since they are really quick and pivoty, absorb tip and tail hits to make the ride smooth and easy and are sporty in the rebound department. They can become a little flappy and loose-feeling if you turn the speeds up to GS-like levels in mixed conditions, but they ski a bit short and are relatively soft, so speed moderation gets the best results. You can ski the Regulators all day in mixed and roughed-up conditions and not feel like you skied that long since their compliant flex and rockered geometry makes pretty much everything low-impact. You don't need to be "on-edge" all the time, and you can ski these with lazy technique and still get a spunky, quick-response ride underfoot. They dampen the hits nicely and isolate the skier from any unpleasant feedback. The Regulators ski short due to the moderately strong tip and tail rocker profiles, so the turn intiation is very quick and feels close to your feet rather than out-front at the tip of the ski. You can flex your way to a pretty much unlimited set of radius measurements during your turn, and finishing the turn is as quick as starting it with the short tail section on the snow. It takes nearly zero effort to get the Regulators to turn into their apex, and as long as you don't over-pressure them, they will follow along your arc until you finish the turn. Over-pressure them and you can push the tip or tail section away due to the soft nature of the flex pattern. This ski likes a punchy, pivoty turn style rather than a press-and-hold carving technique. Again, nearly zero effort to get a directional change, but they stay on-line without wandering, which is really nice. These could be a great ski for intermediates to break into the next level of playful skiing at more athletic levels rather than graduating to a "carving ski" class of boards. A young bird-dog eager to bound around over hill and dale to chase whatever it sees or imagines it sees. Always behaves and comes back when called, just don't let it run too fast across the kitchen floor...you know what will happen. Nothing, other than maybe flatten the tail out a little to increase turn security at higher speeds. Maybe stiffen the ski very slightly for adult weight skiers...but then again, maybe not. These are quick and surfy, zero-effort play toys for all over the frontside, especially in mixed conditions. They don't have great carving prowess, but that's not what the were designed to do. Great example of a soft and playful all-mountain play ski. Demo them if you can to see if their loose and playful feel is what you're looking for, then buy them one size up from normal.